Kerwin Danley left another game after being struck by a pitched ball, this time in Colorado on Wednesday. Kerwin Danley receives care in Colorado. 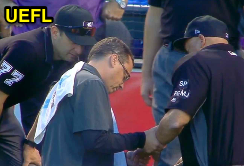 With none out and none on in the top of the 4th inning of Wednesday night's Mets-Giants game, Rockies pitcher Tyler Chatwood threw a 1-2 breaking ball that bounced off the ground and into Danley's left hand or wrist, which he had held in front of his chest during the bounced pitch. Replays indicate the pitch bounced off the infield grass in front of home plate and deflected off of catcher Ryan Hanigan's right shoulder pad before hitting Danley. Danley left the game after attention from the Rockies training staff and was replaced behind the plate by crewmate and 2B Umpire Lance Barrett, with 1B Umpire Jim Reynolds and 3B Umpire Brian Knight sharing field responsibilities. Reynolds additionally assumed the role of acting crew chief, as Danley had been serving as acting crew chief for Dale Scott, who himself has been absent since April 14 when he suffered a concussion as the result of a foul ball to the head. Relevant Injury History: Danley has no relevant (hand/arm) injury history. However, he most recently left a game on July 9, 2017, as the result of a foul ball head injury, his sixth significant head injury since 2008.